We have all heard the saying, “Discretion is the better part of valor.” After watching the July 26th Elk Grove City Council meeting, and specifically Agenda Items 9.3 and 9.4, it appears that members of the Elk Grove City Council no longer possess neither discretion nor valor. Agenda Item 9.3 concerned raising the solid waste service rates for Elk Grove residents. After staff’s presentation, the Council did not utter one word, not one question, not one comment before they unanimously voted to increase their constituents’ solid waste, aka garbage, costs this September and possibly more increases in the coming years. The transition of Utility Billing Services to Republic will reduce expenses (direct and overhead) by approximately $900,000 annually. This savings, combined with some general cost-cutting measures, has negated the need to use Franchise Fee revenue to support Solid Waste administrative services, freeing up over $1.1 million annually for other City purposes. In the opinion of many, this is a generous reward to the city’s solid waste contractor, Republic Services, who was awarded a long term no-bid contract extension by the Elk Grove City Council; and in turn, appears to be extremely thankful based on their campaign contributions to Elk Grove City Council members. Yes, Republic Services gives back to community, donating money for fireworks, sponsored the State of the City Address and funded former Mayor Gary Davis’ charities – most likely tax deductions. But let’s do the math here, it is a very small price to pay for receiving about $1.2 million a year in increased revenue courtesy of Elk Grove homeowners in addition to current revenue which must be in the tens of millions. 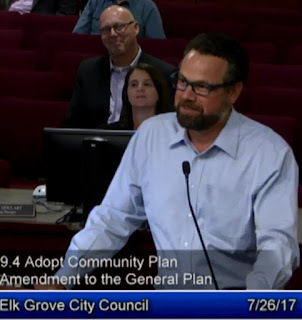 What made this agenda item so egregiously blatant in the lack of valor by the Elk Grove City Council in representing the interests of the very people who voted them into office was the Trump-ish “really, really great” over-the-top style of praise lavished during the next agenda item. What, do you ask, would cause the Elk Grove City Council members to be so giddy and fawn all over an agenda item? It was, of course, yet another developer’s housing project. Do we want a Mayor and City Council who represent the community, with loyalties that are uncompromised, or do we want elected officials who owe their political careers to developers and city contractors? If you believe big special interest money has a corrupting influence on local politics, vote for Elk Grove mayoral and city council candidates in 2018 who are funded by, and will work for, you. Copyright©2017 by Connie Conley. All rights reserved. Surely, Councilman Detrick, besides having many "good friends", knows a thing or two about how monopolies work (PG&E). Republic's various municipal trash agreements are a no-compete exclusive contract for which other competition is barred from entering the market. Throw in employment with governmental agencies, non-profits, maybe even a trust fund baby, and you ask why the Council is so eager to raise taxes (err, fees I mean). In PG&E lingo, they are all 'insulated' from the real world. I may be wrong here, but the shell game that on one hand saves us money by letting Republic do the billing, and then with the other hand takes more money from us, smells kinda fishy. Not only the campaign contributions and the Five Amigos being insulated from the real world of capitalism smells, but I suspect Republic outsources their billing out of state or possibly out of the country! Did our Five Amigos trade livable-wage city jobs in the Billing Dept. for outsourced jobs? No one asked. I mean that $900,000 savings has to come from somewhere. Wasn't that new Household Waste disposal facility supposed to make a bunch of money off the other jurisdictions to help hold our trash bills down? That darn bond just keeps showing up wanting to be paid! This fish smells funny. Throw in a few fries with that and we may have witnessed the makings of the best fish n' chips in town!